Para grupos que procuram uma grande casa imaculada perto da cidade que pode acomodar várias famílias, esta casa é perfeita. O piso principal tem o quarto do mestre com cama king size e banheira de luxo com grande chuveiro e banheira de imersão de grandes dimensões. Também no piso principal são, dois quartos adicionais, um com uma cama queen-size e um com uma cama king-size e há uma sala de família com grande tela plana, som surround, etc. O nível do terraço tem uma sala de beliche com quatro camas de casal em dois beliches e há um quarto de hóspedes com uma cama queen-size. Há também ao longo de um bar com refrigeradores embutidos, mesa de bilhar, sofá secional com 65 'TV de tela grande e som surround, juntamente com um ginásio 16 x 20 com TV, Precor elíptico, máquina de remo, máquina smith, TRX e muito mais. Para festas com mais de 12 e até 16 pessoas, há dois colchões de ar queen deluxe infláveis com roupa de cama (1 Intex Rainha Supreme Air Flow Bed e 1 Serta Raised Queen Airbed w / NeverFlat). Há também um pacote e jogar para seu uso durante a estadia, se necessário. Hot Springs banheira de hidromassagem para 7, cozinha totalmente equipada com uma área de jantar informal que os assentos 6 e uma área de jantar formal que acomoda mínimo 8. 2 noite com um mínimo de 3 noites para a graduação e reencontro semana. Casa partidos não são permitidos nem são eventos ao ar livre. Com a criação desta casa é ideal para várias famílias e também fornece o nível de terraço para a recolha e entretenimento e outros podem fugir para o andar principal por um tempo mais tranqüila. We thoroughly enjoyed our stay! I was a little intimidated by all the rules at first but I understand that some people just don’t have respect for other people’s property. I have to say, the attention to detail and the cleanliness of this home reflects how much the owners really take pride in their property and keeping it maintained. I didn’t realize that there was an attached apartment above the garage that the caretakers lived in. It was brought to my attention in an email the day before we arrived and I was a little apprehensive about that but you wouldn’t even know they were there. I do think that should be mentioned in the description of the home. All in all it was a great time, close to wineries and breweries. We were very happy to find Merriweather just a short drive from the home that was a winery/ brewery combo. You don’t see that much and it was great for our group because some of us were wine drinkers and some only drink beer. It was a beautiful spot and very friendly. I would absolutely recommend this house and stay there again. I messaged with Todd and he was very accommodating and pleasant. Thanks Todd and Kerry for my last girls weekend being single! I’m getting married November 10th so this was my last hoorah before we say I do! Great house with plenty of room. The owners were very accommodating. You can have different activities going on and not feel like your on top of each other. We enjoyed the big yard to play some outdoor sports. The house has everything you’ll need, specifically kitchen gear. With a big group, we saved quite a bit of money cooking at home. We highly recommend staying at this house. We thoroughly enjoyed our stay at this beautiful home in Earlysville. We needed a place large enough to accommodate 10+ family members coming in from out of town for a wedding at King Family Vineyards, and we couldn't have picked a more perfect location. Our family kept saying "how did you find this place...it's perfect!" The ample seating in the breakfast nook and outdoor patio was a favorite hang-out place for the adults in the mornings, and the kids loved having a space to themselves in the game room downstairs. We had a fabulous time, and appreciate the hospitality tremendously. Great for a relaxing getaway with family and friends. The owners were very accommodating to our needs, and the house was gorgeous! 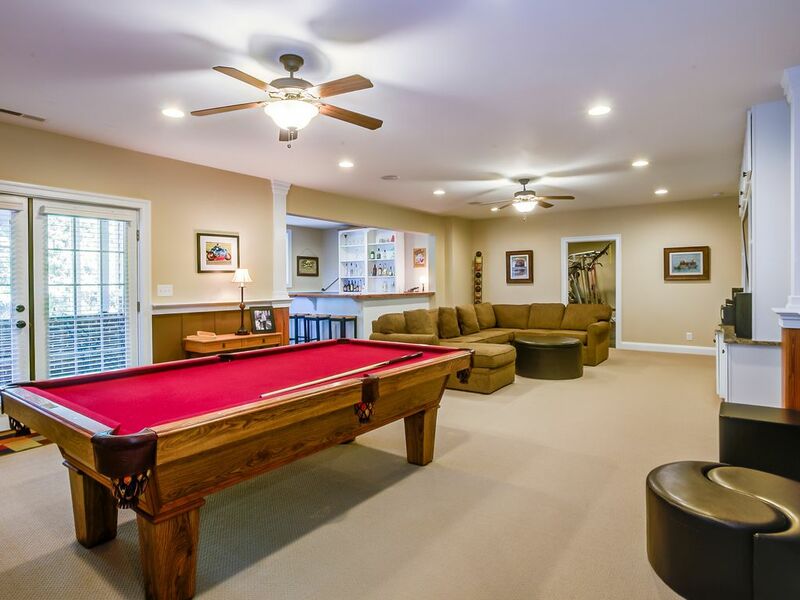 Plenty of room, and entertaining amenities. We had a wonderful stay at Todd and Kerry's home. There were 10 of us for my sister's bachelorette weekend. The house was impeccably clean, beautiful, and so roomy! with 10 of us there we never felt crammed, whether hanging out in the kitchen, the living room or basement. The hot tub outside is an added bonus! I highly recommend staying at this house and I will definitely be back to rent again in the future! Thank you for sharing your beautiful home with us! Sandy we are so happy that you enjoyed your stay and you are welcome back anytime as it is always wonderful to host a group that takes such great care of our home!!!! Although slightly further from downtown Charlottesville than ideal, this home is very spacious and beautiful, with nice amenities. The owner is very responsive and personable. Aside from a few overly prescriptive cleaning requests upon check-out, we were all very happy choosing this location. Casa popular para casamentos, jogos de futebol, beisebol UVA UVA, Wine Tours, Craft Beer Tours, reuniões, semana de graduação e mais.